Last year, Bloomberg News reported that elite athletes like pro golfer Tiger Woods, tennis star Rafael Nadal, and NBA forward Kobe Bryant had all tried Platelet-Rich Plasma therapy (PRP) to repair injured tissues faster. During the treatment, a patient’s own blood is taken, spun in a centrifuge to separate the growth-factor platelets that are instrumental in healing, and re-injected into the patient at the point of injury at a higher concentration to regenerate tissues quicker. There are a number of possible PRP applications being explored. Surprisingly, the scientific validity of this treatment has lagged behind the hype thus so far. But a paper published in the December issue of the Journal of the American Academy of Orthopaedic Surgeons offers first evidence-based recommendations for use of PRP in orthopaedic care. Typically, drugs are required to undergo 10+ years of clinical trials before they reach the consumer market, but therapeutic treatments like PRP aren’t subject to the same scrutiny. The FDA doesn’t regulate these procedures so long as they’re not shipped over state lines, it’s for individual use, and no fanciful advertising claims are made. At one time, platelet rich plasma injections cost as high as $1,000 — not covered by insurance. These days, you can get an injection for under $250, but that is still a high price for many patients. One might wonder who would go for PRP treatment besides professional athletes who are always seeking a competitive edge and faster healing times. Despite mixed results from a handful of limited trials, hundreds of athletes have given the therapy a whirl. The treatment, however, wasn’t highly publicized until Tiger Woods used it for a hurt knee in 2009. Largely, the hype has been fueled by word-of-mouth referrals and celebrity news stories. Tiger Woods told Bloomberg News in a phone interview that the results of his PRP treatment have been “pretty much amazing,” leaving him 75% pain-free, six or seven months after his last injection. “It’s a wonderful alternative to having a replacement done,” he said. 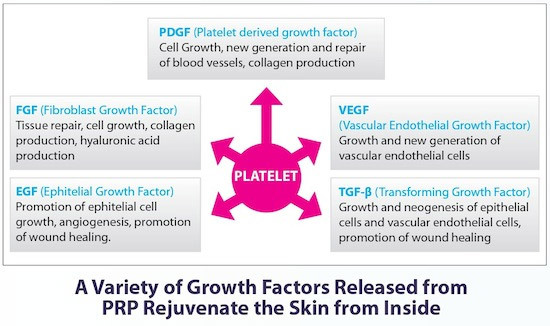 PRP releases a variety of growth factors that can encourage the body to heal itself. Despite all the treatments being done, a January 13, 2010, report published in the Journal of the American Medical Association found PRP to be no more effective than salt water in treating 54 patient with Achilles tendon injuries. Yet, different trials done in 2011 found that PRP lowered blood loss in 81 knee replacement patients and lessened pain for 21 tennis elbow patients. “The science is still questionable,” New York surgeon Giles Scuderi said in 2012. In their December 2013 paper, two orthopaedic surgeons from the Northwestern University Feinberg School of Medicine found that success in PRP depends upon numerous factors — the preparation method, composition of the plasma, the medical condition, the location of the body it’s injected, and the tissue type being treated. Early results proved encouraging for its use in treating knee osteoarthritis, hip arthritis, Achilles tendon injuries, rotator cuff damage and chronic tendinopathies, but researchers say more studies are needed. PRP should not be used for bone healing, spinal fusion, or other bone grafting procedures, they added. » Do Custom Orthotic Devices Work To Help Foot Pain?